I have always had a desire to travel to Uganda for a mission trip. Maybe one day I will. It was from that desire that the idea for this article grew. 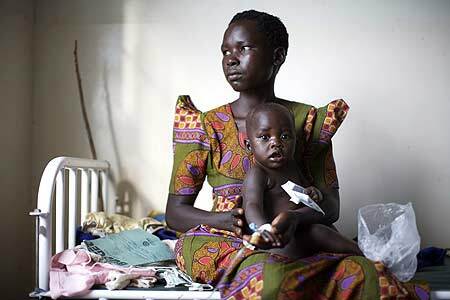 PHOTO: The then eight month-old Martha Akwango, who was suffering from malaria, with her mother Janet Awor in September 2007. Martha and her mother live in Katine, a Ugandan village where the Guardian is participating in a project to improve medical facilities and infrastructure. Photograph: Dan Chung. In my mind’s eye, I see an African mother. She is an amalgam, really….her face a compilation for every young sub-Saharan woman whose picture I have ever seen on the glossy pages of National Geographic magazine. We, in our comfort, like to banter about who we consider our “Most Inspirational Person”. She is mine, but I don’t know her name. Her figure, baby strapped to her back, is a montage from every television commercial that has implored me to “feed the hungry” and every picture brought back from mission trips to Africa by white, middle-class Americans. A powerful beauty, her hair is shorn close to her head (no time for vanity here) and her sandaled feet are dusty. Always, there is at least one child tethered to her body. Her hands are never empty because they are always at task. She doesn’t get coffee breaks or vacations, or time to unwind. Her work is never done. Unlike her First World counterparts, she does not have issues with self-esteem. Survival is the esteemed goal here. Is she a woman who “loves too much”? What about her “inner child”? Does she take healthy time for herself, and is she setting aside time in her busy day for God? No time for that – she hums prayers as she works, and that is her worship. She is a fallible person who makes mistakes, just as we all do. But doubting her Creator is not a luxury she can afford. Her children, barefoot….do they have enough to eat today? Yes? She hums her praise louder. No? Pray and hope, and work all the harder. She doesn’t despair in losing the keys to her car, or fuss about the value of her 401k plan. Her grief, when it comes….is wracking, life-altering. Her loss… it’s behind her eyes if you care to look. In the Western world, we like to say that our lives are our gift from God, and what we do with it is our gift to Him. How presumptuous we human beings are. My Sister in Africa has little opportunity to bring gifts that we in the First World consider valuable. I think God smiles on her offerings especially; they are her very life and the lives of her children. I think that is what God intended us to bring. She inspires me so. I, as a white, middle class mother in America, sometimes wonder why I was not born as she. If life were fair, I mean. If life were fair, I would have been. Sometimes, when my kids are getting on my very last nerve, I think about this woman. Because I often say to myself and others, “If this mothering thing were any harder, I couldn’t do it.” I mean it, too, when I say it. When my children were small, I felt like I knew what I was doing as a mother. Like my Sister in Africa, I wore my babies in a sling on my hip or my back. I nursed them into toddler-hood. It felt natural, like they would be tethered to me forever. Nowadays, as they are approaching young adulthood, I’m not quite as confident. Writing about their growing up and my mistakes as a mother now is my attempt to capture the reality and share it. And yet I know that during the process I will record my own shame. If this mothering thing were any harder…..God would equip me to do it, I suppose. But meanwhile, in a third-world, poverty-stricken, war-torn country in Africa…. I want to meet her one day, to touch her. And to tell her that she is the Inspiration to another mother, all this world away. Loved this Jana, really hits home. I needed this today in my day of self pity on my circumstances. I’m glad you liked it, Lisa. I needed to write it as much as you needed to read it. Love you. LOVE IT! U2 have a HEART for Africa. And sometimes, you don’t even have to get on the plane to meet someone. I think because of your prayers and your words God just preordained a future meeting with a new “friend” in heaven! Wow you were right Eirely the same as we talked about last night. I have felt the same way in my life. Great job!